Quality Silver has been trading online since January 2003 and was set up by husband and wife team Jason & Helen Beer who still run the website today. Jason had been working as a goldsmith since 1988 for various companies in the local area, and Helen had been working in accounts and customer service in London. The website was launched to sell quality silver jewellery which was both well made, as well as great value which was becoming harder to find on the High Street. We hand select every product which we sell, and will not sell any item that is either hollow or cheaply made. Since 2003 the website has grown with a loyal customer base due to the great products, and fabulous customer service. During the early years a new material started to be used in jewellery, called Titanium. We were one of the first online to start selling titanium jewellery and were surprised at how well the titanium range was selling. In 2005 we launched the website Quality Titanium.co.uk off the success of the titanium jewellery sold on the Quality Silver website. Quality Titanium primarily sells titanium jewellery, including titanium rings and chains from UK companies such as Kit Heath, Unique Men and Ti2 Titanium. In 2008 we started to design and manufacture our own range of jewellery in tungsten carbide, titanium and zirconia ceramic to be sold alongside our other products on both websites. Since 2008 the range has grown to over 200 products and has been the best selling line across the websites. In 2010 we branded our own range of jewellery as Titan Jewellery, and launched the website TitanJewellery.co.uk which is exclusively our own range of alternative material Jewellery. As well as the success of the above websites, we were also able to purchase a 50% share of a reputable Jewellery shop in Maidstone, which is also a stockist for our Titan Jewellery Range. With our Titan Jewellery range we wanted the rings that we sell to be accessible to as many people as possible, and not just cherry pick the most popular sizes and believe that we have the largest choice of finger sizes available in the UK. We have in stock rings available in small sizes from I right up to the largest Z+10 sizes, all sold from stock. 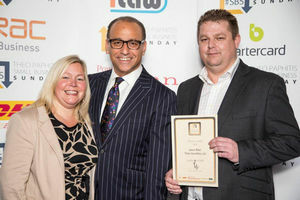 In September 2013 our Titan Jewellery website won a small business award from ex dragon Theo Paphitis in recognition for the achievement Titan Jewellery had made with its website, and products. We welcome your comment at any time, or your e-mails should there be an item you are trying to find - we are expanding both websites all the time, and therefore we may still be able to obtain a product even if it is not on either web site. We have access to the full range of Kit Heath and Tianguis Jackson ranges even if it is not shown on the web sites.